← Kids Need Jobs, Too! Laws Require WorkFlex – Really? There’s been a lot of talk recently regarding flexible scheduling policies in organizations. All kinds of people have been writing about whether such policies are actually beneficial or harmful for businesses, as well as questioning if flexible scheduling polices are really essential or non-essential to things like employee engagement, well-being, and productivity. Actually, I think these discussions miss the point and I don’t think any of these questions can be answered on such a broad scale. The potential for flexible scheduling policies to help or hinder an organization is dependent on a whole series of variables, making such questions decidedly organization specific and not answerable as a larger theme that applies to all organizations. What we can confirm about flexible scheduling policies however, is that they are a highly regarded benefit and broadly implemented by some organizations. 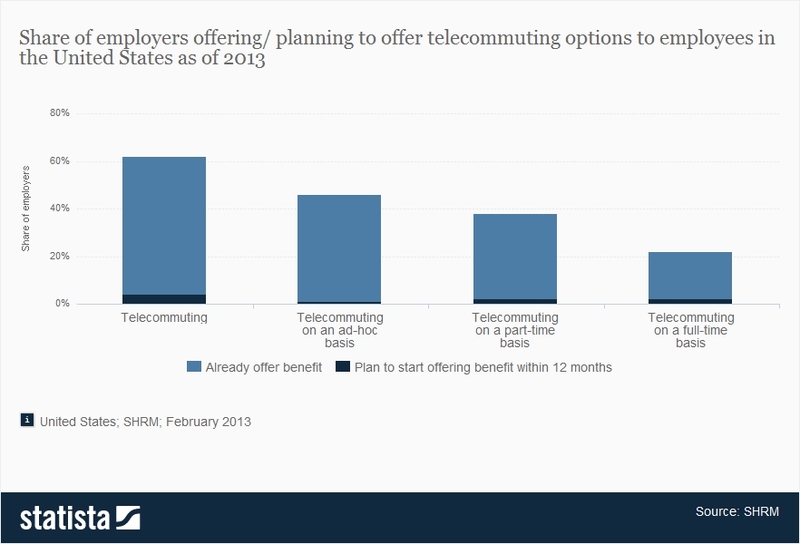 The graph below from Statista, detailing data from a 2013 Employee Benefits Report by SHRM, found that in the U.S in 2013, 58% of employers offered the option of telecommuting to some of their employees and 4% planned on starting to offer telecommuting within the next year. This data gives us a rough idea of the implementation of flexible scheduling policies within the U.S, and with more than half of employers offering telecommuting options it’s obvious that this is an approach worth discussing. We can clearly point to Marissa Mayer’s decision to ban telecommuting at Yahoo! (see my post here) as one of the major sparks in the recent discussions around flexible scheduling. Adding to the controversy is legislation that has passed in Vermont and now San Francisco, requiring certain organizations to seriously consider employee’s requests for a flexible work schedule. The most recent legislation around flexible scheduling passed just last month on October 8th 2013 in San Francisco. The Family Friendly Workplace Ordinance (FFWO) will become operative on January 1st 2014, and mandates that employers with twenty or more staff give employees in caregiver roles the right to request a predictable or flexible work schedule. To qualify an employee must have worked for the organization for more than six months, work at least eight hours a week on a regular basis, and be a caregiver for a child or children under the age of 18, a parent(s) over the age of 65, or a person(s) with a serious health condition in a family relationship with the employee. If an employee meets these standards they have the right to submit a request for a flexible schedule and their employer is required to meet with them within 21 days. The employer is required to respond to the request within 21 days of their meeting and if the employer denies a request they must explain the denial in a written response that sets out a bona fide business reason for the denial and provides the employee with notice of the right to request reconsideration. Legislation like this raises a whole new set of questions around flexible scheduling policies. The San Francisco ordinance is positive in that it helps to protect employees against discrimination based on their caregiver status, however, at the same time, could you argue that legislation like this goes too far? Does it restrict an organization’s right to organize their business in the way they see fit, and most conducive to achieving goals? The FFWO could be positive in prompting employees that desire flexible scheduling policies to speak out – employees that may have previously felt afraid to voice such requests do to the bureaucracy of their organizations. But what will the effects be on organizations that have never implemented flexible scheduling policies? Will the ordinance cause a roadblock and additional internal conflict? These are some of the top questions that come to mind as I consider the implications of flexible scheduling legislation. What do you think?